Nearly a year after it opened its Downtown Brooklyn retail store, Apple has temporarily expanded its New York footprint by taking over the Howard Gilman Opera House across the street in preparation for the theatrical introduction of new products for the holiday -- beyond its freshly released 2018 iPhones and Apple Watch Series 4. Last November, Apple was scrambling to finish the new Downtown Brooklyn store itself, which was delayed after a huge pane of glass shattered and had to be replaced in a rushed custom order. Not even a year later, the store is uniquely hosting a major Apple event -- one that marks the first time the company has shown off new hardware at an event on the East Coast since Macworld Expo 2002. That trade show was the last event outside of San Francisco to host a keynote delivered by Steve Jobs; the entire era of Apple headlining industry trade shows only continued through 2009. In the decade since, Apple has picked venues on its own to host tightly managed media events, most recently including the Steve Jobs Theater at Apple Park, where the company introduced its newest iPhones and new Series 4 Watches. For years, Apple unveiled its new iPod and iPad models at San Francisco's Yerba Buena Center for the Arts, a venue reasonably close to its Cupertino, Calif., headquarters. This spring, however, Apple took the unusual step of inviting the press to a school in Chicago, Ill., to feature its new Apple Pencil-compatible iPad and education-focused software at an event titled "Field Trip." The Brooklyn event scheduled for Oct. 30 continues this expansion of introductions outside of California. 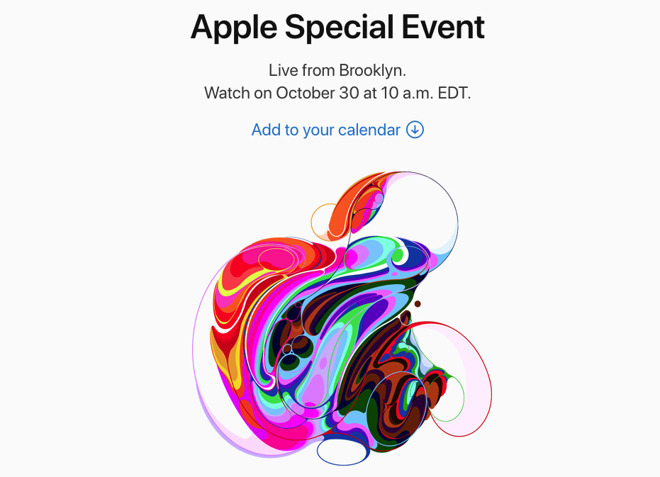 The company may have chosen New York as its latest event setting to capitalize attention on the design industry—a theme that appears to be incorporated in the unique, perhaps Apple Pencil drawn "There's more in the making" invitations sent to members of the media, as well as the artwork portrayed on the company's special event website, and the matching abstract figures painted on the venue itself. In fact, Apple not only put a colorful wrap on the dramatic windows fronting the Howard Gilman Opera House (part of the Brooklyn Academy of Music), but even painted matching designs on the bricks of the side wall facing the street that the theater shares with the new Apple store across from it. The colors of the design are also reflected in the Apple logo that hangs above the Downtown Brooklyn store, effectively stitching it all together. Evidence of Apple's presence can also be seen underground in Atlantic Terminal, a major commuter rail and subway station just across the street. Anyone arriving by train will be unable to miss all of the billboards touting Apple's current "Behind the Mac" campaign, which portrays various creative-looking people working in professional settings on a conventional notebook. Below the event: "Behind the Mac"
There do not appear to be any advertisements promoting iPad, although the event is expected to debut both new iPad Pro and new MacBook models, along with potentially other new hardware such as AirPods, the conspicuously missing Air Power charging mat, and perhaps new software as well. The thematic use of design, the emphasis on Macs as tools for professionals, and the positioning of iPad and iPad Pro models as Apple's affordable, easy to use, and highly mobile answer to PCs and netbooks all might help to explain why Apple is sparing no expense to host two major events on both sides of the United States within just a few weeks of each other. iPhone and Apple Watch naturally belong together as a pair of devices carried on your person, while Macs and iPads both target different kinds of users at work or in education. One thing they all have in common is that Apple is leveraging its global chain of retail stores to sell and support them. That appears to be prominently acknowledged in siting the event across from a recently opened landmark store, perhaps an homage of sorts to the Jobs-era of Apple keynotes delivered in downtown San Francisco near one of the company's first flagship retail locations, giving attendees the opportunity to buy the freshly-released gear. Unlike any other major consumer electronics company, Apple has long detailed quarterly unit sales along with revenue figures for its major product categories. This initially helped investors get a sense of how many buyers Apple was attracting with its Macs, and later began to reveal to investors how iPod and then iPhone were reaching entirely new audiences. Here's a look at why that's now changing in Apple's Fiscal 2019.
the last 20 years, Apple has shifted from selling Macs in a world dominated by Windows PCs to being a dominant global brand that services a vast installed base that's more valuable, influential, and lucrative than Windows was at its peak. Apple wants its investors to understand that, and is now challenging the media narrative that suggests it running an unsustainable race against various manufacturers churning out ever-increasing volumes of hardware units. Over the past two decades, Apple has proven capable of exercising its rapidly lithe, innovating ability to take its existing technologies and create new computing forms that retain its influence over the most commercially successful and strategically important markets. That winning strategy of the past also appears to be the best suited for the future of PCs. Why did Apple throw a Tim Cook Event at its Steve Jobs Theater? As a company, Apple has shifted dramatically over the last eight years since the passing of Steve Jobs. This week’s "it’s show time" event was a primary example of this, being the first to focus entirely upon non-hardware product offerings while introducing a series of celebrities talking about their new projects to create content that has nothing to do with the computing technology that has always defined Apple. What’s going on?